So yesterday was my hubby's birthday & I still hadn't bought him a gift, so me & my baby girl took a ride to ToysRus. He loves playing xbox and there was a Star Wars game that he wanted. These games are so expensive that we only buy them for special occasions like birthdays or holidays. Now toysRus is having a sale this week-you buy one at regular price & get a second for 40% off, so I began looking for something that the rest of us would enjoy too. I love the kinect games because you have to move to play the game, so this is the type of game I was looking for. Then, there it was!! 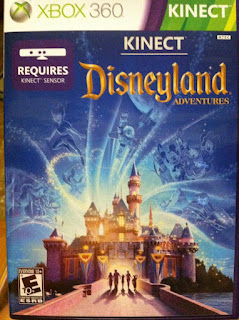 The Disneyland game for 19.99 and I would get 40% off of that.....I was soooo getting it! She played for over an hour and it was hysterical. She was in Disneyland!!! After the whole kinect sensor debacle, the game was very easy to play. After a while she didn't need my help at all.....she knew where to go and since she now knows how to read, she knew what she needed to look for and where she had to go. She was very good at following directions. Her favorite part was giving the characters a hug!!! So cute!! I definitely recommend buying this game if you have kids who love Disney. It is fairly easy to play, especially if the kids can read, but if not you can read any instructions to them. Most of the time, the characters tell you what they want you to look for and where to go......It really is a great game. Her only complaint is that her arm was tired, since she had to keep her arm in front of her to move her character in the game. *This is not a sponsored post, product was purchased by me with my own money. We love Disney video games!